Clueless and heartless politicians like Paul Ryan and Donald Trump argue that the people of the United States would be better off without food stamps, Obamacare, and workplace protections. Congresswoman Rosa L. DeLauro knows these folks are just plain wrong. Growing up in New Haven, Connecticut, DeLauro saw firsthand how vulnerable hardworking people are in the face of corporate indifference and government neglect. From fatal industrial fires to devastating childhood poverty, DeLauro witnessed it all—and emerged convinced that social programs are worth going to the mat for, again and again. Worker protections, Social Security, unemployment insurance, Medicare, Medicaid, food stamps, and child tax credits lift up all Americans; they fulfill this country’s promise of opportunity for everyone, and are essential for our country’s health. For twenty-six years, DeLauro has been fighting for everyday Americans, earning a reputation as the most impassioned defender of our social safety net. 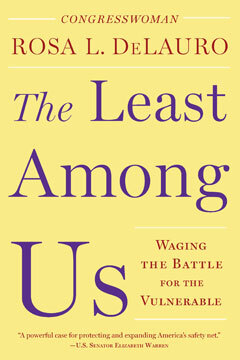 The Least Among Us tells the story of a quarter century of deal-making on behalf of people too often overlooked, told by a woman as fearless as she is opinionated. Part House of Cards, part progressive manifesto, The Least Among Us shares lessons about power—how it’s gained and how to wield it for everyone’s benefit.